Ask someone who lives on a tropical island, but who originally came from more northerly climes, what he misses most about "home," and he’ll often tell you it’s autumn — the creeping chill, the deepening colors and aromas of spices and ripening fruit in the air. If there is any wine that captures that autumnal feeling perpetually in the glass, it’s the California red wines made from the Zinfandel grape. The varietal characteristics of Zinfandel are often described as berryish — more precisely, like raspberry or blackberry jam, mixed with aromas of freshly ground pepper and often cinnamon and clove. But Zinfandel is more than a flavor, it’s also an experience: At its fullest, red Zinfandel almost gushes, like liquid cornucopia, out onto the palate. The color is vividly purple — sometimes black as a moonless night. The aromas are ripe and intense, and the feel in the mouth vigorously alive, dense, almost decadent with those wild berry qualities. 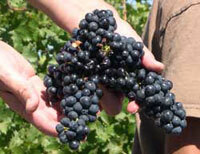 Zinfandel is also versatile; grown, as it is, in virtually all the wine regions of California. Zinfandels come light and easy and Zinfandels come thick and plodding. They can be straightforwardly berryish, or they can be layered and complex with multiple fruits, oak and spice. Until not too long ago, most Zinfandels were soft, simple affairs; not too different from easy drinking French Beaujolais or Italian Valpolicella: good spaghetti wines. Then again, who doesn’t need a wine for spaghetti? The image of many of today’s Zinfandels is more serious. While still piquant and fruity, they can also be bigger, oakier, more refined and complex, and possibly capable of at least some bottle aging. In this respect, they are closer to classic French varieties such as Cabernet Sauvignon and Pinot Noir. The best Zinfandels, in other words, can be great. What Makes for a Great Zinfandel? 1. An exceptional full body — a heart-pounding 14.5 per cent alcohol size and generosity of tannin, thickening the palate without hurting it. To heck with subtlety, it was the immense, dramatic feel that still makes this wine burn in our memory. 2. An almost dizzying array of aromas. First, the distinct blackberry Zinfandel fruitiness, ripe without being overripe or pruney. Second, a pungent, spicy note, like sticking your nose into the bottom of a pepper grinder. Third, the deep, warm, vanilla-like fragrance of French oak. Whereas most Zinfandels of the late ’70s (and even up until today) are aged in rawer-scented American oak barrels, the use of French oak in an American Zinfandel in the late '70s was like dressing a pauper like a prince… and it worked! 3. A terrific balancing acidity — lifting the natural fruit qualities — filled out by the wonderful feel of glycerol (a higher alcohol component), adding up to a sleek texture and overall sense of grace and proportion in spite of the wine’s giant size and fruitiness. We never thought of a big, California-hewn Zinfandel as something that could possibly be described as "elegant" until that '77 Clos du Val; vinified, as it were, by Bernard Portet, a winemaker originally born, raised and trained in France’s Bordeaux region. So like the classic red Bordeaux (and their California counterparts made from Cabernet Sauvignon), we ended up enjoying the Clos du Val, and many of the finer, more complex Zinfandels tasted since, in a variety of food contexts. There is little argument that beef is always best with Cabernet Sauvignon, but a sturdy, sweetly berryish Zinfandel goes amazingly well with roasted prime rib bathed in horseradish-tinged natural jus; better yet, thin slices steeped in soy, sugar, sesame, garlic and ginger in the fashion of Japanese, Mongolian and Korean marinades, charcoal-grilled or seared on a smoking hot iron, and plopped on steamy white rice. 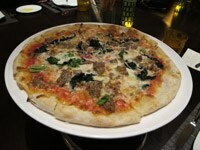 It’s also said that lamb calls for Cabernet Sauvignon or Bordeaux. In the late 1970s, both Montevina and Carneros Creek Winery made a number of positively black, jammy, cinnamon-and-pepper spiced Zinfandels, inundated with oak and 14 per cent-plus alcohol, that bring back fond memories of drinking with legs of lamb caked with mustard, as well as racks of spring lamb grilled on the "barbie" with chunks of eggplant, or coming out of the roaster dripping with buttery bread crumbs and slathered with sweet mint jelly. It was a great time to be young, in love, and more naturally trim around the waist! Because of their mildly acidic, zesty quality, many Zinfandels make a sensible match with Italian inspired meals. Start it off nice and easy with a classic: an antipasto plate — roasted bell peppers, marinated mushrooms, egg fritters, soft, springy Mozzarella and all — washed down with one of those curiously pink (more like pale salmon) "White" Zinfandels. Typical bottlings such as Sutter Home and Beringer may be unabashedly fruity, but are no-brainers with first bites generously drizzled with sweet, winy balsamic vinegars. Second course: a pasta such as fettuccine tossed with mushrooms and parmigiano, or linguine with clams, mussels, tomato, garlic and some pungently defined cheese like pecorino. This is where the moderately scaled red Zinfandel classics — like Louis Martini or Sebastiani or the lighter coastal blends by Ridge Vineyards — start to shine. You really don’t want a big, hunky style of Zinfandel with pastas; just something moderate, easy, bright and snappy, and that can even be served slightly chilled (or on ice cubes, on a warm day). For the meat course, you’ve got the fats and proteins for the most concentrated Zinfandels, ripened long enough to reach alcohol levels ringing past 14 per cent and even 15 per cent, with corresponding levels of tannin and jammy fruit intensity. It doesn’t have to be lamb and beef, especially since pork — a roast dripping in juices, pan fried with rosemary, or smothered in white wine and herbs — may very well be the ideal foil for the biggest and baddest brands, such as the single-vineyard bottlings of Ridge, Turley, Ravenswood, De Loach, and Rosenblum. But will the big, bad Zinfandels age? Who cares? At just three, four, or five years of age they are perfectly delicious. In fact, there are more than a few aficionados who believe that if laid down for over, say, eight years, a high-alcohol Zin begins to lose its fruitiness, thus leaving a wine that tastes more of bitter tannin and mouth burning alcohol. So you should never be afraid to open a brand new bottle of Zinfandel, red, pink, young or old. In fact, pour any of the better ones into a good sized (at least 14 oz.) glass and smell… ahh, autumn!